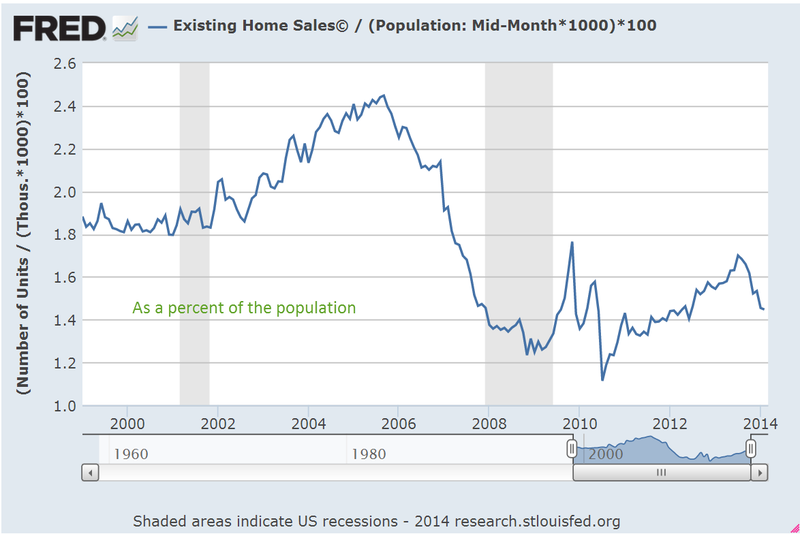 Sales of existing homes in March were disappointing, dropping 7.5% year over year. Some analysts use the 5 million mark as an indication of a healthy housing market. As a percent of the population, the change in existing home sales is rather small, yet the change of ownership prompts remodeling projects and home furnishing purchases after the sale, spiff ups before the sale, and commissions and fees for real estate professionals at the time of the sale. As a percent of the total stock of homes, sales are likewise small yet determine the valuation of everyone’s home. There are concrete consequences: a lowered evaluation of a home’s value might mean that a person cannot get a home equity loan to help start a new business. As we discovered in this last recession, lowered valuations of a home can mean that homeowners are upside down on their mortgages. Low valuations “box in” a homeowner’s choices so that they may feel that they can not move to a nearby town to be closer to a new job. These cumulative effects can promote a defeatist attitude among homeowners. In the past several years, many of us recently found that we were worth less – $50K, $100K, $200K – because the value of our homes had dropped. Even though many of us had no intention of moving, we felt poorer. The methodology underlying the calculation of the Consumer Price Index (CPI) involves the concept of Owner Equivalent Rent (OER). The CPI treats home ownership as though the family who owns the home is renting the home to themselves. In this sense, owning a home is like a owning a U.S. Treasury bond that pays regular interest payments, or coupons. Until the recent recession, many regarded home ownership as though it were a Treasury bond, unlikely to ever lose value. Even better than a Treasury bond, a house was likely to gain in value. Most of us, however, do not think in terms of OER. We feel poorer when the value of our home drops by 20%. Likewise, a stock market drop of 20% has a significant effect on the value of our retirement funds. Even if we do not need that money for 10 years or more, we are poorer on paper and this affects many other buying decisions. 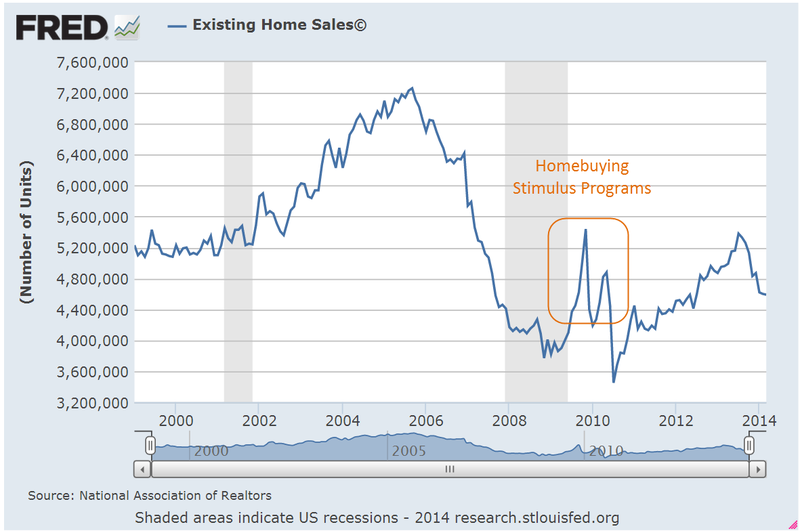 Other economic reports this week offset the negative news on home sales. The flash, or preliminary, index of manufacturing activity indicates a positive report next week on the sector. Durable goods orders were strong, reinforcing the signs that manufacturing is on a spring upswing. New claims for unemployment were a bit above expectations but nothing significant and the 4 week moving average of claims indicates a much improved labor market. Although UPS and 3M had disappointing earnings or forecasts, industrial giants GM and Caterpillar surprised to the upside, as did tech giants Microsoft and Apple. Expectations for this earnings season were rather lukewarm but the aggregate earnings growth of the SP500 may come in below 1%. Some attribute Friday’s drop in the market to accelerating tensions in Ukraine but the market was essentially flat this past week, reflecting a general lack of enthusiasm or worry. Put 10% of the cash in short-term government bonds and 90% in a very low-cost S&P 500 index fund. I suggest Vanguard’s. (VFINX) I believe the trust’s long-term results from this policy will be superior to those attained by most investors – whether pension funds, institutions, or individuals – who employ high-fee managers. Doughroller presented some good observations on Buffet’s recommendation. Also at the same site Rob Berger offers a fresh perspective on the stock – bond allocation mix. In a recent analysis of trends in the various components of the Consumer Price Index, Doug Short presented several graphs of the annualized growth rates of the different components. It comes as no surprise that medical care costs have risen 70% in the past 13 years. The real surprise to me was that college tuition costs have shot up almost twice that – 130% in the same period. Average tuition and fees for an in state student at a public four year college are currently almost $9K per year. The growth in costs should worry parents with a son or daughter six years away from entering college. Perhaps they may have planned on $10K – $12K a year. However, if these growth trends remain as constant in the coming years as they have in the past, tuition and fees will be more like $15K per year when their child begins college. By the time they graduate – if they graduate within four years – the cost could be $20K per year. Remember, this doesn’t include any housing costs. Higher education receives heavy subsidies from each state and the Federal government. So why the skyrocketing tuition costs? Heavy lobbying, influence in the state capitols in the nation, inefficient and bloated administrative structures, protectionism – these are just a few of the reasons for the escalation in costs. A spokesman for higher education won’t give those reasons, of course. She will cite the need to attract quality teachers, investments in new technologies, aging infrastructure that is costly to maintain, and those certainly do contribute to increasing costs. Higher education is still largely built on a framework that was suited for the sons of the landed gentry in the 18th and early 19th centuries. As Obama and voters discovered after the 2008 elections, change comes slowly. Like the tax system, higher education will continue to receive incremental changes, a hodgepodge of patches to fix this and that, to pad the pockets of this interest group or ameliorate a select slice of voters.